Dorothy Baker Designs: Snow, Snow and More Snow! I can't remember when we've had as much snow as we have had this winter. I spent 2 hours yesterday shovelling the driveway, and they're calling for more today! I hate it and I'm aching all over! LOL DH went out this morning, before he left for work, to clear around the side and back of the house, so the delivery men can bring in the new washer and dryer. They're supposed to leave the old ones on the curb to be picked up, but they'll have to leave them on top of the piles of snow! What do you think? I think I still prefer the look of the neutrals, but I might change my mind by the time I get this one put together. I like both versions of Vintage Tiles, but I think I like the neutrals version best. Is this pattern available? Will it be? Love your work. Be careful shoveling snow. Oh how pretty - I love the colors. Your work is just great - and it's good to see you posting. Hope you don't have much more snow to shovel. Thankyou for visiting my blog. 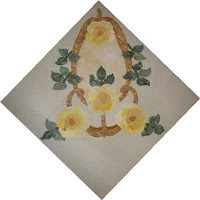 The Vintage Tile quilt in the neutrals is still my favorite too. Can't wait to get it back from the quilter! I think I like the neutrals best BUT those red tulips are quite stunning - I just love them.